�Hey, look at this!� I keep saying that to my friends as I show them the range of motion I now have in my right arm. I can actually use it again! Last summer I was miserable. I had a lot of pain and immobility caused by my torn rotator cuff. I kept thinking it would get better if I just babied it. No such luck. The first doctor I went to said that the tear was so severe they would have to cut it open for the repair. That�s too invasive for me�I decided I needed another opinion. I remembered Midwest Ortho, and set up an appointment with Dr. Cole. He was so reassuring�and said they could take care of it arthroscopically. I scheduled surgery that day. Surgery went without a hitch on November 19. I also had a bicep tendonesis in addition to the rotator cuff repair. I was diligent with my physical therapy, which I think helped the recovery process. 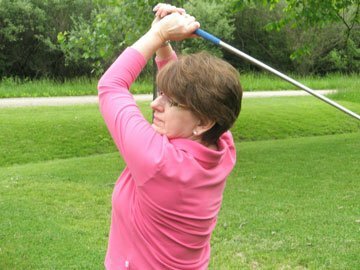 It has been five months since my surgery, and lo and behold, I can now swing a golf club. I�m excited to be able to get out there and enjoy this summer. Thanks Dr. Cole, Natalie, Kyle, and your entire staff. You were always available and were so quick to follow-up with any questions I had. By the way, I recommend you to everyone!